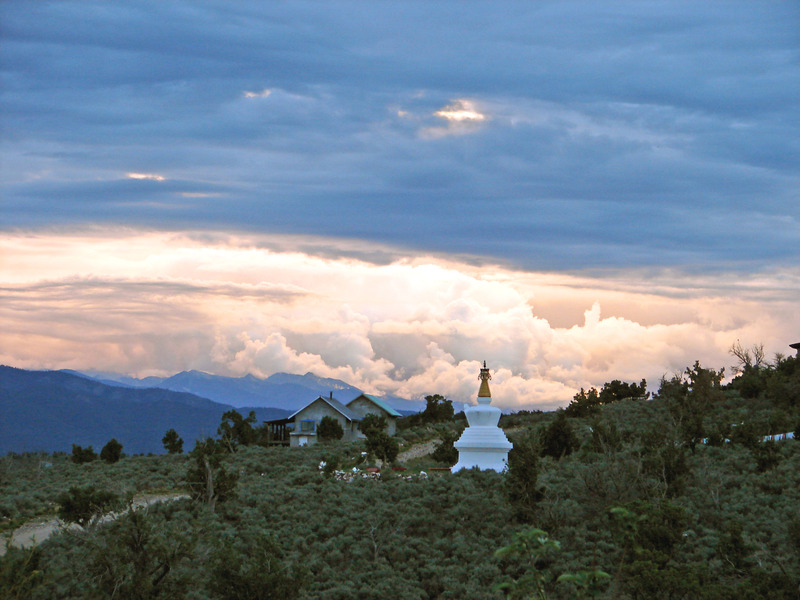 In our previous house, an off-grid, passive solar house that I designed and built, we were blessed to live across the rocky dirt road from a Tibetan Buddhist community. Their gold-gilt stupa framed our view of the Truchus Mountains to the south. We are not Buddhist, but we sure loved having Buddhist neighbors. Our closest neighbors, and dearest friends, were both ordained Buddhist lamas. They were also old hippies who cussed and farted and complained liked the best of us. No halos there! We loved them fiercely and still do. A view we will always miss. One of the biggest points of contention between us was the fact that they would kill nothing – not even flies in their house. Yet they ate meat. I would tell them that was hypocritical! How could they eat the flesh of an animal someone else killed when they believed they should never kill another sentient being? Apparently it had to do with karma, and they wanted their karma to be clean. So I would razz them and say, “But it’s OK for someone else to taint their karma so that you can keep yours clean while eating a fat steak? Sorry, but that just doesn’t work for me.” We would always laugh and slap each other lovingly on the back afterwards, and in time we just stopped having that conversation. I respected their beliefs, even if they weren’t always my own. This couple also worked in an assisted living facility. They cared for the old folks there, changed their diapers, sponged their atrophied limbs, and gave them emotional support. Sometimes they helped them die, just holding their hand until their spirit passed from their tired, shriveled bodies. And when the health of their old dog began to fail, they were perfectly prepared to midwife Kunga’s spirit into the next world too. I said, “Aren’t you going to have him put down?” But they refused, saying that everyone deserves the respect and patience of their loved ones to die on their own time line, when they are good and ready. And so they changed the pad under Kunga’s body and washed the poop from his fur – for months. And final Kunga was ready to pass on. On his own schedule. When our time came and each of our 3 ailing dogs in turn became crippled with old age and cancer, we spoke to our vet at each visit. When will we know? She said, “They will tell you when it’s time. You will know.” And she came to our house each time and sat on the floor with us, holding the empty syringe, and our fragile hearts, as our canine children left us one by one. Were we wrong to take their time of death into our own hands? Was it for their comfort, or our own? They were suffering certainly. But perhaps they had the right to walk their own paths – the right to suffer their own pain. Perhaps that was their way of preparing for leaving this world. But it was breaking MY heart to watch. Selfish? I don’t know. Can you describe how you slaughter your goats? I would never slaughter anything. I am a woman. I give birth. I give death. I am Kali, dancing through birth, life and death. I do not slaughter, kill, murder, or take life. I give the gift of death. The giving of death is a sacred rite. We are very serious about it. We never threaten death for misbehavior. We set the date for giving death and tell the animal when it will be. We invite the soul or spirit of the goat to get ready to go; pack your bags! It’s not easy. At the opening talking stick with the thirty women in my German apprentice group, all but one of them complained: “Why are you asking us do this terrible thing of giving death?” The last woman said: “I have come to this apprenticeship because I want to learn to give death. I keep a herd of sheep and I can’t stand it anymore to have to hire a man with a gun to slaughter them.” When the day came, three weeks later, to give death to the rabbits we had tended, verbal battles ensued because so many women wanted to be She-who-holds-the-knife. They understood the value of what I asked. I believe that death is a peaceful process – the act of the soul actually leaving our physical bodies. I believe it can be a true gift to be free of our cumbersome earthly existences and the pain and suffering of life on this plane. And so much of what Susun expresses resonates with me. But I struggle with the vocabulary of “giving” death. Since I have also made sure my goat had an enjoyable life, who am I to say he wants my “gift”? Who am I to chose the date for him? Yes I am a mother, and for all practical purposes, Bucky’s mother. I bottle fed him from 10 days old forward, weened him, and have fed and watered him twice daily since (or seen to it that he was). I have insisted he is healthy, happy, has plenty of exercise, shelter, respect, and even affection. So as his mother, I do feel I have more than the average right to take away his life too. Is that the Goddess Kali speaking through me? The Creator and the Destroyer? The Birther and the Burier? Giving birth to a child is the most potent thing I have ever experienced. I could feel the raw power of all women before me surging in every contraction, every push, in the fiery burn and tearing of flesh – my flesh – as each of my children entered this world. One dead. One alive. And was my son’s death a “gift” I gave him? Bad question for a mom who has lost a child at birth, unless you want to see all the anger of every woman who has lost a child before me channeled through my trembling body. I know some believe that souls have contracts with each other, and destinies can be decided long before we inhabit our bodies. But the thought that my soul would have agreed to lose my first born is a hard one for me to swallow. Maybe. I am not saying it’s impossible. But my current incarnation does not have a memory of signing those divine papers. And what about Bucky? Did our souls make a contract too? Did he choose me to be his human mommy, like my human children did? Was his death by my hand on Saturday, January 26th, 2013 his pre-ordained soul choice? 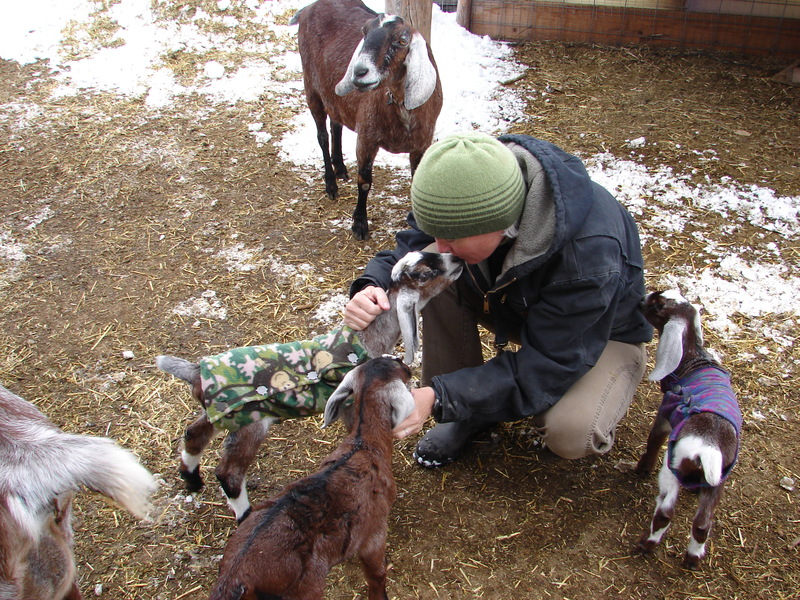 I never thought the harvesting of a goat could bring forth so much emotion and deliberation in myself and my readers. I thought it would be a pretty simple thing when I led 10 day old Bucky into his new home behind his cousin and aunt, and dutifully warmed his 4 daily bottles of auntie milk. After all, he was so obnoxious, and so goofy looking with his horrid conformation and overbite. But as a young adult, he’s become quite sweet. I think I will even miss him. Getting a goaty kiss from a week old Buckbeak, AKA: Bucky. So it seems the extra week I have given back to myself is for a reason. It gives me time to fully look into all my resistance and dread, my extreme discomfort, delve into the process of death itself, prepare Bucky (for I do, now, intend to tell him), learn to shoot the gun which I have never fired (that will be tomorrow), ground myself, center myself, and put forth my intention. With the help of friends’ (and strangers) comments, questions and listening ears, I am feeling calmer each day as the count down continues. The processing helps me tremendously. And with this additional time for introspection, I have learned where my stubbornness is coming from. Why do I really feel I have to do this? Be the one to pull the trigger or draw the knife? It is a rite of passage of course. As was giving birth…. giving life. And like Kali, I too, can take life away, to give that life to feed my family and myself. Because when the nanny berries hit the fan, I want to know I have the guts. I want to know I can provide. I want to know I can care for my brood, my herd, my child and husband. That I have what it might take. For that is what Mother means to me. THE Mother. The Giver. The Taker. on January 22, 2013 at 1:33 am | Reply Laura S.
Don’t do it! He’s part of the family. Go to the store and get some hamburger. Lol! But think of those tasty kabobs on the grill! !